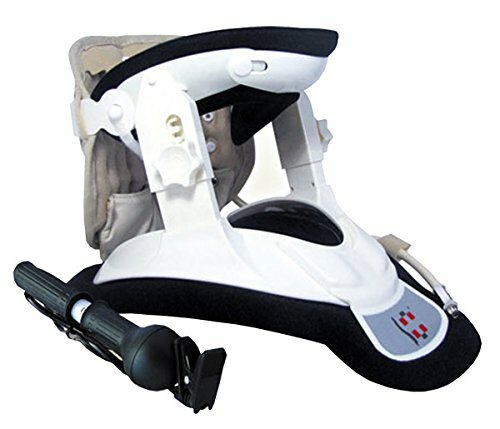 Patented FDA Guaranteed New Medical Neck Cervical Traction Device Portable Home Use, Therapy Unit Provide Relief for Neck and Upper Back Pain, Dizziness and Limb Numbness. Alphy Neck Traction Device 3000 with the Design Patent for cervical collar(Patent No. : US D719,265 S) provide you with the Neck & upper back pain relief - Relieves neck and upper back tension, decompresses joints while reshaping the natural curves of the neck and upper back (hump region). Improves ranges of motion in the neck & upper back and gets to the cause of neck and upper back pain and stiffness fast. It also support you by relaxation of mind & body, many use it just before bedtime to relieve head, neck and upper back discomfort, stiffness, stress and to fall asleep easier. Others use it before or after a workout or a busy day to help reduce chronically compressed discs & joints and to increase ranges of motion. It's a perfect time to relax, deep breathe, and to decompress. Each individual, of most age can benefit from the Alphay Neck Extraction Device, who are currently experiencing from: 1.Tired, long time sitting, pain felt by shoulder muscle spasm, soreness shows and more like the shoulders sink; 2.Improper working posture, especially the bow workers, neck soreness pain due to improper posture, as well as cerebral ischemia and hypoxia lead to dizziness (All black ahead), and even the upper limb lift weakness and fingers numb; 3.Back muscle tension and soreness caused by Tired and Cold, can be eased by exercise or massage,but easy to be recurrent; 4.Improper sleep body posture, feeling a headache, dizziness, limb numbness, some will have nausea. Feel free to click "Add to Cart",start your wonderful journey! 5）Patented with FDA Guaranteed. Portable, easy and convenient for the use, effectively improve the symptoms, reduce the recurrence and advance the life quality. If you have any questions about this product by ALPHAY, contact us by completing and submitting the form below. If you are looking for a specif part number, please include it with your message.